An interesting nugget from the big new Pew Research Center poll of the 2016 election: Among voters under age 30, Donald Trump is at 21 percent … and Gary Johnson is at 22 percent. Yes, Trump is in danger of finishing third among young voters — at least according to this one poll. But it’s not the only one showing him struggling with them. Similarly, a Quinnipiac University poll last week showed Johnson, the Libertarian Party nominee, and Jill Stein, the presumptive Green Party nominee, combining to take slightly more millennials (defined as ages 18 to 34 in this case) than Trump. Suffolk University also showed Johnson carving off a significant portion of young voters (18 to 34), at 15 percent, to Trump’s 27 percent. 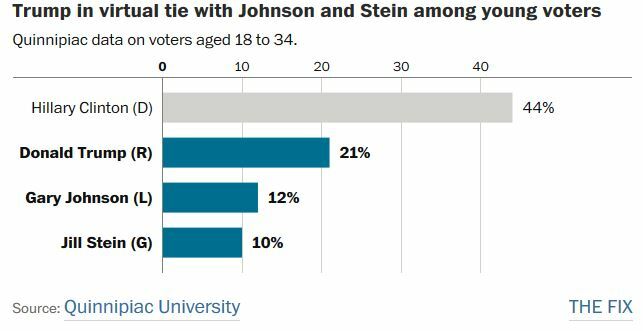 But it’s also true that young people are a much friendlier demographic for third-party candidates. They are more likely to identify as independents and supporters of third parties, and it’s no coincidence that they have led the way for politicians like Ron Paul and Bernie Sanders in recent years. Young people also happen to be among the most resistant to both Trump and Clinton. Post-ABC polling shows about 6 in 10 don’t like Clinton and 75 percent don’t like Trump. Both are the highest among any age group. All of this makes me wonder how Bernie Sanders might do if he were to accept the offer from Jill Stein to replace her as the Green Party candidate. In a related story, The Washington Post also noted the effects of race and demographics will have over the next four decades. Donald Trump’s racism and xenophobia is not doing the Republican Party any favors. Between these demographic changes and the lack of support among young voters, it is possible that either the major parties will change, or we will see the emergence of a new political party which counters the authoritarian right views of both Clinton and Trump. Sanders, Stein, and Johnson all differ substantially from Clinton and Trump on issues including foreign policy, civil liberties, and the drug war. The recent death of Antonin Scalia (which I discussed here when the news first broke) has led to a lot of well-deserved criticism of his record. 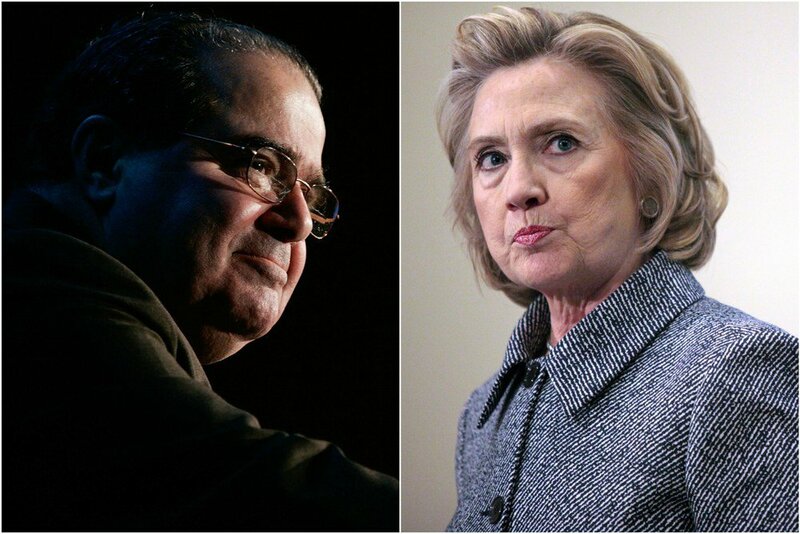 While his conservative votes have been damaging in some areas, it should be kept in mind when evaluating the candidates that, on civil liberties issues, Hillary Clinton is to the right of Scalia. 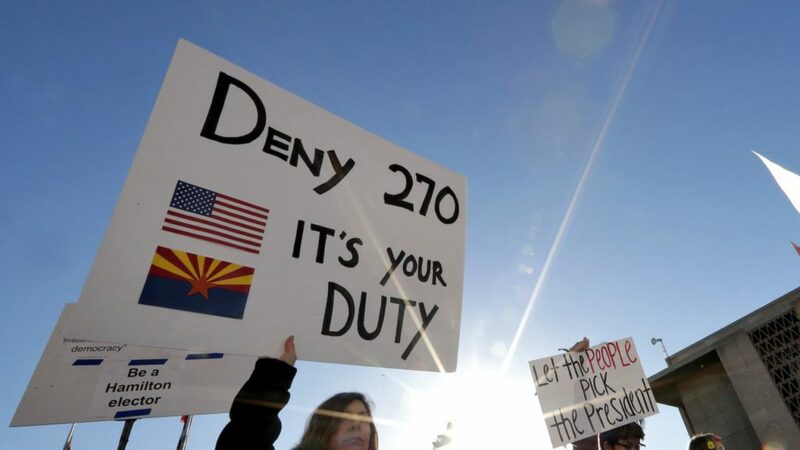 The effort to get presidential contenders to sign on the American Freedom Pledge has been promoted by organizations ranging from the Center for Constitutional Rights to Human Rights Watch, MoveOn.org , Amnesty International USA, the Brennan Center for Justice, the Campaign to Defend the Constitution, the Electronic Frontier Foundation and True Majority. More importantly, Clinton adopted the DLC strategy in the way she governed. She tried to portray herself as a crusader for family values when she introduced legislation to ban violent video games and flag burning in 2005. Once again, Scalia’s vote here proved decisive: He wrote a lively majority opinion for just five justices, holding that a state could not constitutionally forbid children from accessing violent expression. Two justices held that states could sometimes censor violent video games; two justices held that states always could. But Scalia’s spirited pro-speech opinion garnered the necessary votes to become the law of the land. We’re losing a lot of people because of the internet. We have to do something. We have to go see Bill Gates and a lot of different people that really understand what’s happening. We have to talk to them, maybe in certain areas, closing that internet up in some ways. Somebody will say, ‘Oh freedom of speech, freedom of speech.’ These are foolish people. We have a lot of foolish people. We have a lot foolish people. Of course Donald Trump has made many other statements which are abhorrent on civil liberties issues, but it remains disturbing that on an issue as fundamental as freedom of speech there is so little difference between Trump and Clinton. Often followers of a candidate demonstrate the same values as the candidate. I have found this to be the case with many followers of Hillary Clinton. I have received a lot of arguments from conservatives who disagree, and sometimes get quite upset, when I criticize Republican politicians. However I find the response from Clinton supporters to be even worse. They not only get upset about criticism of Clinton, but beyond disagreeing their arguments quite often center around claims that it is wrong to criticize Hillary Clinton. At least conservatives understand that criticism of their candidates is part of living in a democracy. Far too many Clinton supporters do not have this rudimentary understanding of freedom of expression. While Ron Paul had a small devoted group of supporters, everyone knew he had no real chance of seriously competing for the Republican nomination. There’s something about being a new face, and being from the Senate instead of the House. 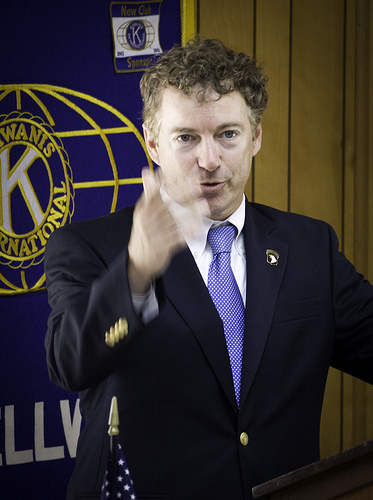 People are looking far more seriously at the possibility of Rand Paul becoming the Republican nominee. Not that long ago, most Republican leaders saw Rand Paul as the head of an important faction who, like his father, ultimately had no shot at becoming the party’s presidential nominee. Now the question is no longer whether Paul can win the nomination, but whether he can win a general election. The shift follows a year in which the Kentucky senator has barnstormed the country, trying to expand the party’s base beyond older, white voters and attract a following beyond than the libertarian devotees of his father, Ron Paul. Although the job is far from complete, Paul has made undeniable progress, judging from interviews with more than 30 Republican National Committee members meeting here this week. That he has struck a chord with this crowd is all the more telling because it is heavy with GOP establishment-types who tend to prefer mainstream candidates. 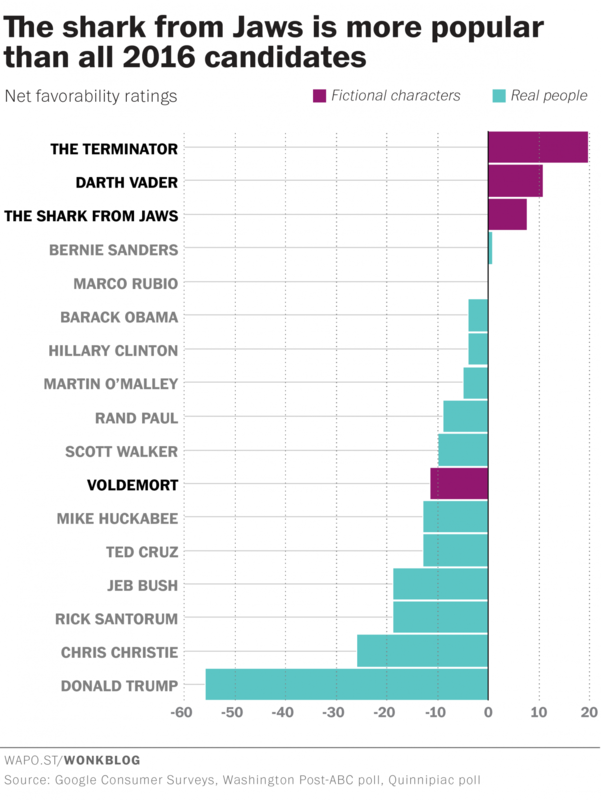 At the moment it doesn’t really look likely that Rand Paul could win, but they said the same about Ronald Reagan. 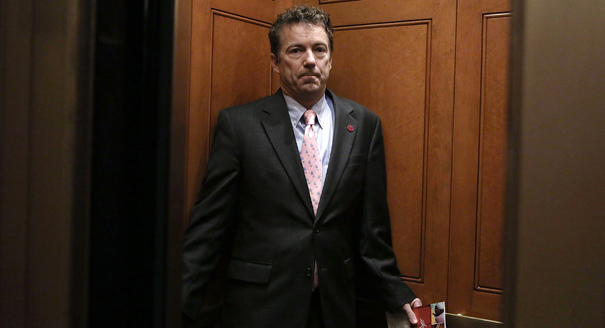 Many of Paul’s views remain at odds with the Republican mainstream, but he now seems less of a pariah among Republicans than Mitt Romney was in many circles. It is possible Paul could win a primary battle with the vote divided between more conventional Republican candidates. He would also benefit from the first contests being a caucus in Iowa and a primary in New Hampshire. He could conceivable wind up in first place in both and quickly turn into the front runner. If Paul does win the nomination, Democrats might need to rethink handing the nomination to Hillary Clinton. What happens when the Republican candidate starts attacking Hillary Clinton over her support for the Iraq war, drone strikes, NSA surveillance, the Patriot Act, and the drug war? Paul might also turn Clinton’s close ties to Wall Street into a serious liability. Many potential Democratic voters might find that they agree with Paul and disagree with Clinton on several issues. Of course Rand Paul is also on the wrong side of many issues, but can we count on Clinton to take advantage of this? Republicans already have managed to put Democrats on the defensive on issues such as Medicare and health care–two issues where they have facts and principle firmly on their side. Paul would face many obstacles. His opposition to abortion rights could limit his ability to win over female voters from the Democrats, perpetuating the gender gap between the parties. His anti-war views would be a negative in many red states, possibly even leading to upsets in some red states by a hawkish Democrat such as Clinton. Looking at the electoral college, I don’t think Paul could win, a race between Clinton and Paul would shake up many of the current party-line divisions. I could see Paul taking some states such as New Hampshire from the Democrats, but not many with large amounts of electoral votes, with the possible exception of California. Still, with their current disadvantages in the electoral college this might be the best chance for Republicans, and a potential threat for Democrats, especially if looking at shaking up the current Democratic advantage among younger voters. I could see many young males being far more interested in Paul on the issues where he is more libertarian, while not being as concerned about issues such as preserving Medicare. This could destroy what now appears to be a long-term Democratic advantage, considering that people tend to stick with the party they chose when young. Democrats might still win the 2016 battle by running Clinton against Paul, but could suffer long term from such a match up. I don’t know enough about the politics in science fiction fandom to know if this is the case, and wonder if “getting a lot of flak” is simply a daily occurrence in fandom for many regardless of their political views. His books are selling. He was nominated for a Hugo, which hardly makes it appear like he is truly ostracized for his beliefs. Reynold’s view in this op-ed also looks suspicious to me because of his claim that Robert Heinlein could not get a Hugo Award today. I am a huge fan of Robert Heinlein, and know many liberals who share this view. 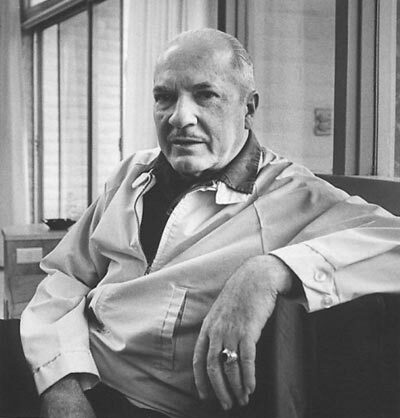 There are aspects of Heinlein’s work which attracted liberals, conservatives, and libertarians, and most liberal science fiction fans I know do not have an ideological litmus test for enjoying the work of an author. Heinlein died in 1988 which also makes it impossible to categorize him by today’s political battles. His support for individual (and sexual) liberty and opposition to religious dogma and racism would align him with liberals over conservatives on many current issues. Whether he would be categorized as a libertarian today would depend on which of the many strands of libertarianism you are speaking of. I suspect he would only have contempt for people such as the Koch brothers who use government to make money while only being consistently libertarian in opposing regulation of their businesses. Heinlein was even further away from Ron Paul ideologically. While he displayed considerable support for the military in Starship Troopers, published in 1959, I wonder if his support for the Viet Nam war would have changed if he lived longer, and if he would have approved of the misuse of military power to invade Iraq. Reynolds also cited the ouster of Mozilla CEO Brandon Eich, but again conservatives who desire to portray themselves as the victim generally gave a simplistic and incorrect description of this event. Mozilla is not a traditional company, and those in the Mozilla community who saw Mozilla as more of a cause than a business were responsible for forcing Eich out. Some liberals weighed in with concern over whether it was fair for Eich to be forced out over his political beliefs. 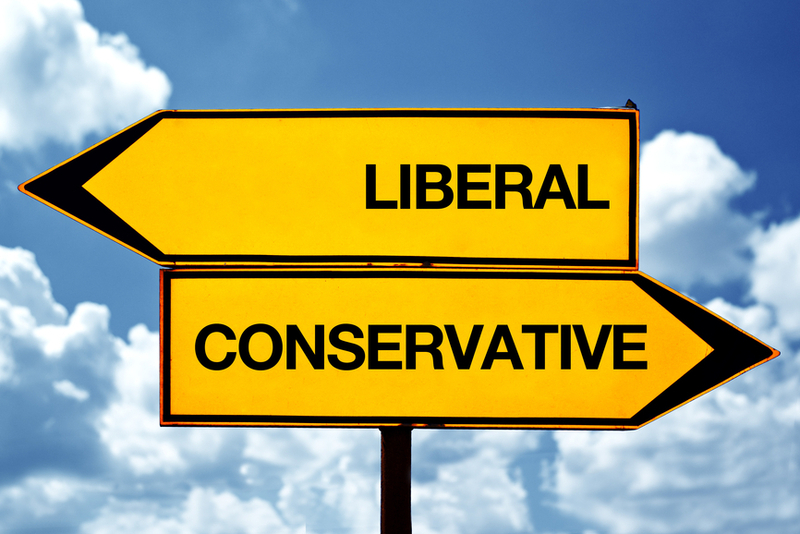 Tests to tell if someone is liberal or conservative are of uncertain significance but often amusing enough to take a look at. 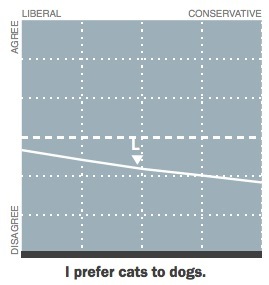 From a survey, Time has found, among other things, that liberals are more likely to like cats than conservatives. Cats are less likely to follow authority. It does make sense that liberals would have a greater affinity for these freedom-loving animals, while conservatives, who are more into authority and imposing their rules upon others (regardless of their rhetoric) might not like them as much. Other questions show a similar distinction with liberals being more supportive of liberty while conservatives being more interested in authority. For example, conservative authoritarianism leads to a preference for more neat and tidy desks. If we were to follow the logic that liberals prefer cats more than conservatives due to their preference for liberty, then we might think that libertarians would be ever bigger lovers of this anarchic animal. It turns out that libertarians fall between liberals and conservatives on each question. With a little thought about the state of the libertarian movement, this actually makes sense. Libertarians include those who are true opponents of restrictions on liberty, but many other libertarians are basically conservatives who have smoked marijuana. They have hung out with Republicans for so long that it has become difficult to tell them apart. Some libertarians, such as Ron Paul, share many views with the religious right. Plus, as I have noted in the past, Ron Paul’s views would lead to a less free society. Anyone know his opinion of cats? In researching the question I did find a Cats and Kitties for Dr. Ron Paul Facebook Page, but that doesn’t tell me if the attraction is mutual. I wonder what additional information I can find over at FriendFace. Of course this data is open to other interpretations. Allahpundit at Hot Air wonders if the survey shows that liberals like cats more than conservatives because women tend to like cats and more women are liberals than conservatives. It is also possible that cats work better as pets among liberals who are more likely to live in urban areas. Similarly, the tendency for conservatives to be older than liberals might explain why they are more likely to use Internet Explorer, but it appears that Allahpundit might be as quick to write someone out of the conservative movement for using IE as for supporting a tax increase.